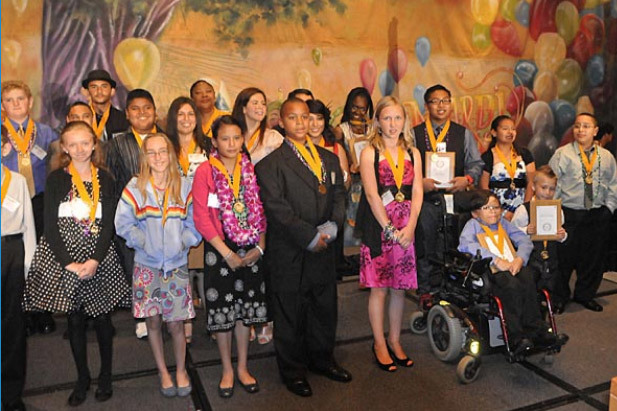 Nearly 90 students in the Long Beach Unified School District, or one from each school, were honored at the recent Most Inspiring Students Awards at the Long Beach Hilton. The evening of stories about local students who have beaten the odds was sponsored by the Long Beach Education Foundation. This year's Mardi Gras theme was brought to life with student performances, courtesy of the Cabrillo High School Steel Drum Band and Renaissance High School Dancers and Singers. One of the top coaches in basketball, U.C. Berkeley’s Mike Montgomery, was the keynote speaker. Masters of Ceremonies were Frank Mottek, news anchor for KNX 1070 Radio; and Mike Murray, president of the foundation. Winning the Superintendent's Distinguished Community Service Award at the event was the Port of Long Beach. MOST INSPIRING -- Alvarado Elementary School student Nancy Melena, joined by Long Beach First Lady Nancy Foster and other dignitaries, was one of nearly 90 students honored at the Long Beach Unified School District's annual Most Inspiring Students Awards. The Alvarado fourth grader was nominated for rising above her challenges and devoting many hours after school to push herself academically.